Made from high density polyethylene plastic, this Pirate Ship’s playground steering wheel is sturdy, durable, and ready for interactive play. A rich green color with sunny yellow accent; your Pirate’s Ship Steering Wheel is both long-lasting, and adds a classy visual to your playground. With easy-to-follow, illustrated instructions, and all the required hardware included – simply attach this friendly wheel to your existing play set to kick-start your child’s next expedition. 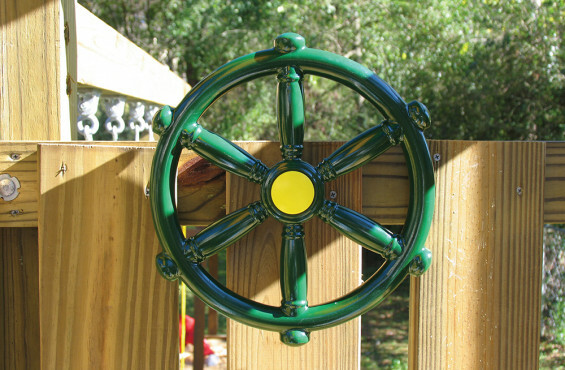 This Pirate’s Ship Wheel is perfect for ages 3 and up, and is an excellent addition to any part of your wooden swing set. Even better, you get a friendly 5-year warranty, so you can be sure your Pirate’s Ship Wheel lasts long into the future.